Dolly Dilettante: Have You Ever Seen A Vintage Tina Turner? Have You Ever Seen A Vintage Tina Turner? It's just something about the hair and those great legs! Yup, that's who she reminds me of all right. Of course she doesn't have a real name, I never think of great names for my dolls. But I think of this little lady as the fabulous Tina Turner. 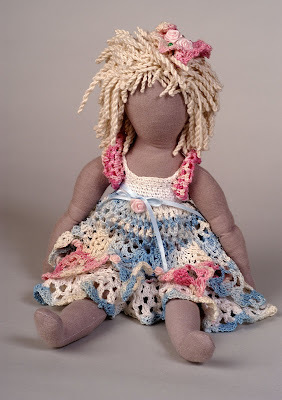 She is made from my homemade version of an Edith Flack Ackley doll. EFA dolls were made famous in the 1930's and 1940's. EFA dolls are little, sweet and are made in endless variations. They usually have a distinctive face, with tiny square black embroidered eyes and a wee rosebud mouth, and 2 dots for a nose. My dolls faces are a bit different from the original pattern. As you see, Tina is not finished but soon she will have my version of a little face. I like more realistic embroidered eyes and nose so I will finish Tina in the next two weeks and you will see her new face. Tina is made from my favorite old linen dress, soft from many washings. It took me three days to twist and hand root her cotton fiber hair. I thought I would never finish but I loved the thick mop that appeared . . . finally. Tina is very flexible and can pose in any position. She is simply fun to play with. I love her dress Meg - did you make it? Aw, sweet. Love her body. Nicely stuffed. Are you sure her name isn't Wanda? Your talent doesn't cease to amaze me! She is gorgeous! You are amazing Meg ! simply the best ;-)))) wonderful and lovely. All "Dolled-Up" for the Camera!